If you're like me, you've never had these before. It wasn't until I moved to a small town that I was introduced to efficient yet delicious cooking. Over Memorial Day, we went to the cemetery as we do every year to show our appreciation and remembrance of those who have died for our freedom. After the salute, we all disband and go to lunch. This year, we went to Tyler's aunt and uncle's house where they served pulled beef sandwiches. Oh. My. Gosh guys. They were outstanding. The only problem is that I forgot to ask for the recipe. I ended up having to improvise with what we had in the house and it turned out AMAZING! Before we get started, know that I just started using crockpot liners because if there's anything in the world I hate more than folding socks, it's cleaning the dirty crockpot. These things are brilliant. Now, place the bullion, stock, soup mix, and water in the bottom of the crock. Give this a quick stir then toss in the roast followed by the onion and pepper. 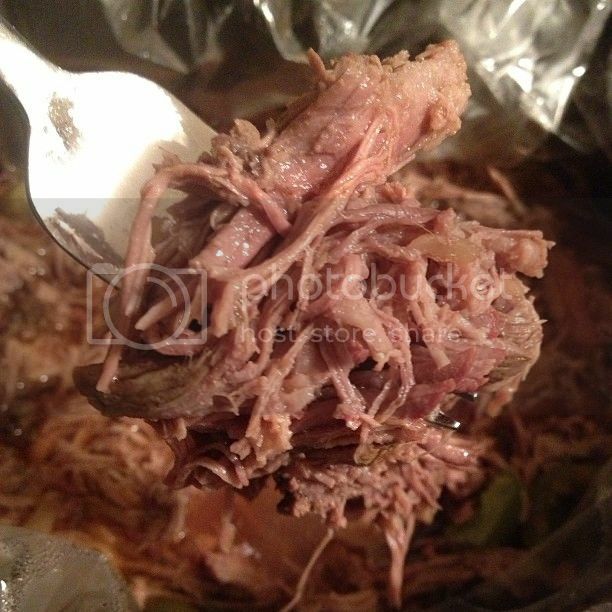 Remove roast from crockpot and shred using two forks. Return juice to juices for serving and turn crockpot to "keep warm" or "low"
When you're ready to serve, open Kaiser roll, place meat on roll using tongs, and if you love a gooey sandwich (like me), add a couple tablespoons to the meet before placing the top bun on the sandwich. YUM!